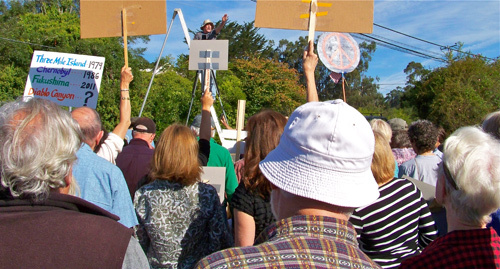 Approximately 65 people showed up Sunday morning in West Marin School’s parking lot to take part in the Occupy Wall Street movement, which began Sept. 17 in New York City and since then has spread around the world. As of two weeks ago, there had been protests in 70 major US cities and more than 600 smaller communities. There had also been protests in more than 900 foreign cities. A Time magazine survey earlier this month found that 54 percent of Americans have a favorable impression of Occupy Wall Street while 18 percent do not. The movement is in essence a protest against the unequal distribution of wealth in the United States and elsewhere. In this country, the protesters’ slogan “We are the 99 percent” refers to the disparity in wealth between the top one percent of society and other citizens. The phrase came out of the 2000 presidential candidate debates between Al Gore and George W. Bush. Gore repeatedly accused Bush of supporting the “wealthiest one percent” rather than the welfare of everyone else. That was followed by a 2006 documentary film, The One Percent, made by Johnson & Johnson heir Jamie Johnson. The film noted that the wealthiest one percent of Americans then controlled 38 percent of the nation’s wealth. Already this country’s disparity in wealth was well known. In 2001, Joseph Stiglitz, a Nobel winner in economics, had written that the wealthiest one percent of US citizens at that time controlled 40 percent of America’s wealth. Among those assembling to be photographed at West Marin School was Congressional candidate Norman Solomon (in blue shirt). Sunday’s protest lasted less than half an hour and caused no disruptions. Because Occupy Wall Street has no list of specific demands — only that income should be spread more evenly and that large corporations should have less influence over government policies — some politicians and mainstream media have dismissed it as irrelevant. House Majority Leader Eric Cantor (R-Va) characterized the movement as “growing mobs” and said President Barack Obama’s “failed policies” have pitted “Americans against Americans,” leading to the protests. White House press secretary Jay Carney then accused Cantor of “hypocrisy” since Cantor has been supporting Tea Party protests. “I can’t understand how one man’s mob is another man’s democracy,” Carney said. The protests are coming at a time when millions of Americans have lost their homes and many millions more have lost their jobs largely because of big banks’ risky lending, which triggered a stock-market crash that has led to a recession. Point Reyes Station photographer Art Rogers, who currently has an exhibition at the Jack Mason Museum of West Marin History, documented the event. Here he directs protesters to find spots where his camera can record everyone’s face. As it happens, Occupy Wall Street is the brainchild of Canada’s Adbusters Media Foundation, which publishes an advertisement-free, anti-consumerist magazine Adbusters. The foundation last summer proposed a peaceful occupation of Wall Street to protest corporate influence on democracy. By now Canada itself has had protests in all 10 of its provinces. In this country, Vikram Pandit, head of Citigroup, has called the protesters’ sentiments “completely understandable” and said Wall Street has broken the trust of its clients. Bloomberg news service on Oct. 12 reported, “Hedge-fund manager John Paulson, who became a billionaire by betting against the US housing market and then profited from the recovery of banks, criticized the movement. His townhouse was among those targeted by marchers who left a fake tax-refund check made out for $5 billion on his doorstep, which was barricaded by police. Regardless of New York tax rates, the Occupy Wall Street movement by Sunday had spread 2,580 miles from that metropolis on the East Coast to this small town on the West Coast. Only in Point Reyes Station, there was no Zuccotti Park where sometimes-animated protesters have been camping out near Wall Street. Here there was just a brief get-together in the parking lot of West Marin School where 65 residents stood absolutely still to be photographed protesting. The editor and publisher of The West Marin Citizen, Joel Hack, will retire after this week’s issue, which will be published Thursday, Oct. 20. Advertising director Linda Petersen of Inverness will take over ownership of the weekly newspaper. 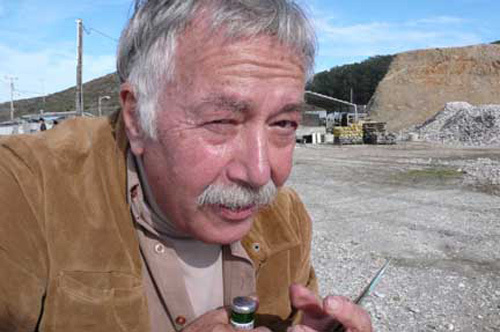 Before Hack started The Citizen, he had been the editor and publisher of The Bodega Bay Navigator for 12 years. But after unsuccessful negotiations with Robert Plotkin of The Point Reyes Light and after losing several major advertisers in a real estate market down turn, Hack in August 2006 dropped the print version and began publishing exclusively online. So why did he start The Citizen in West Marin? 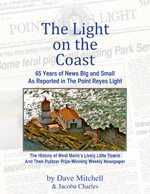 In November 2005, Plotkin, a new resident in Bolinas, bought The Point Reyes Light from me. At the same time, he offered to buy The Navigator from Hack, but when they couldn’t strike a deal, “he decided he would just take Bodega Bay over,” Hack said. Instead of providing highbrow reporting, however, Plotkin quickly offended many West Marin readers with coverage that was often lurid — a full-color, front-page photo of two chickens, whose throats had just been slit, hanging upside down with blood pouring from their necks, a girl chomping into the severed head of a goat during festivities on Mount Tamalpais etc. Nor did The Light go over well in Bodega Bay. Plotkin sent three reporters to cover stories there, Hack said, but the venture “lasted only about a month.” With Plotkin unfamiliar with Western Sonoma County, Hack explained, “the coverage was a little off.” Plotkin ran into the same problem when he tried to extend The Light’s coverage to Fairfax in East Marin, Hack added. Reporter Lynn Axelrod of Point Reyes Station inspects last week’s issue. 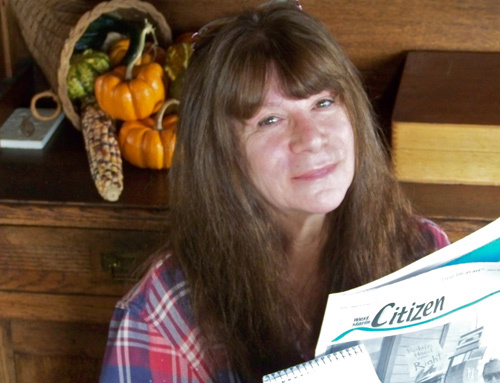 Her reporting and editing are expanding under The Citizen’s new structure. Meanwhile, Plotkin and I soon had a falling out, and I stopped submitting occasional pieces, for which I was not charging, to The Light and sent them to The Navigator website instead. In selling The Light to Plotkin, I had signed a non-competition agreement that I would not write for another Marin County newspaper, but attorney Robert Powsner on Plotkin’s behalf got Judge Jack Sutro to issue a bizarre injunction against Hack and me that barred my posting on Hack’s website. Powsner told Sutro that my posting on the website was “damaging or destroying” The Light, and the judge accepted the claim. In chambers, Sutro told lawyers for both sides that protecting Plotkin’s $500,000 investment in The Light outweighed constitutional prohibitions against censoring free expression. Moreover, the now-retired jurist didn’t seem to understand the Internet and ruled that a Sonoma County website is the same as a Marin County newspaper. Linda Petersen had been my houseguest when Hack began looking for an advertising representative. She took the job and played a major role in getting the newspaper off the ground financially. Her role at the paper eventually expanded to include business and reporting. What will her title be as owner? Hack has suggested “la jefa” [the chief], she responded. Hack was already feeling “a little thing of anger” toward Plotkin for trying to go into competition with him after he revealed The Navigator’s finances during business negotiations. Then came the injunction. Added to that, “readers in West Marin were pissed off,” Hack said, so in July 2007, he started his own weekly newspaper in Point Reyes Station. The results were gratifying. “People popped in and wanted to work on The Citizen,” Hack said. “Outside contributors and staff had a sense of what a community newspaper should be. In the first year, we did very well. We had lots of advertisers and lots of readers — really good readers. In contrast to Plotkin, who often was viewed as an outsider in West Marin, Hack did his best to take part in the community. 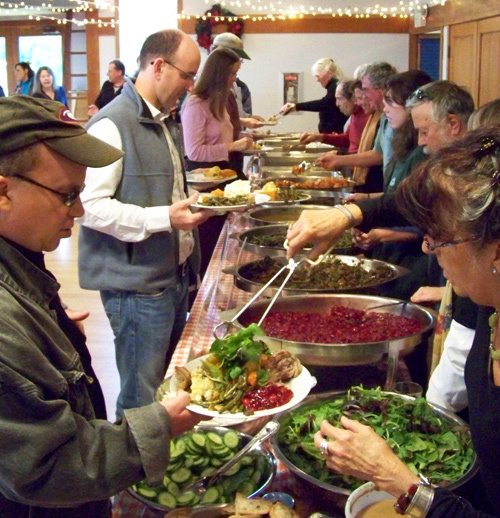 Here the mustachioed publisher served a guest at the 2008 community Thanksgiving Dinner in the Dance Palace. As for Plotkin, he had acknowledged he would take a “financial bloodbath” when he sold the paper. He reportedly received about $150,000 for The Light after paying $500,000 for the newspaper and periodically subsidizing it. What’s next for the two newspapers? Could the 63-year-old Point Reyes Light and the four-year-old West Marin Citizen ever join together as one? Nothing is in the works, which is too bad, for it means two small-town weeklies will continue to split West Marin’s readership and advertising. Both papers have had to take dramatic cost-cutting measures. The Light can no longer field as many reporters as it once did, and both papers have had to relocate to cheaper quarters. In the last year, The Light moved out of Point Reyes Station and now operates from a small office behind the Inverness Post Office. 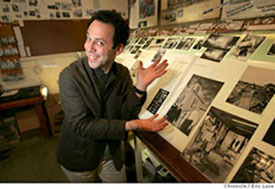 The Citizen, which had been renting the old Point Reyes Station Library next to the Pine Cone Diner, moved into filmmaker John Korty’s former studio on B Street. The Light is now owned by Marin Media Institute, and friends of The Citizen have begun looking for investors from the community to become part owners, along with Petersen. 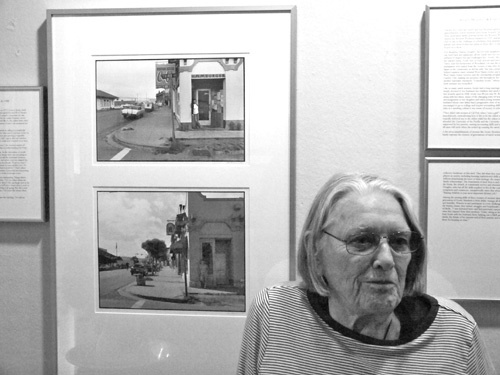 Women of West Marin, a show of black-and-white portraits by Art Rogers of Point Reyes Station plus commentaries by journalist Elizabeth Whitney of Inverness, opened Sunday in the Jack Mason Museum of West Marin History. 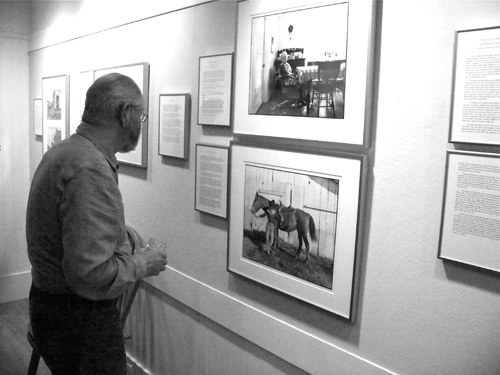 A guest ponders photographs of rancher Alice Codoni Hall (top) and her granddaughter Carol Horick (below). Nearly two dozen images of people who have been notable in West Marin’s modern history are included in the show. Organizing the exhibit were Mary Kroninger and Meg Linden. Noting that more than 100 guests showed up, Kroninger said, “It was the best attended of recent openings.” Among those on hand were seven of the people in the portraits: Carol Horick, Celine Underwood, Dakota Whitney, Laura Wold Rogers, Nancy Hemmingway, Pat Healy and Elizabeth Whitney. 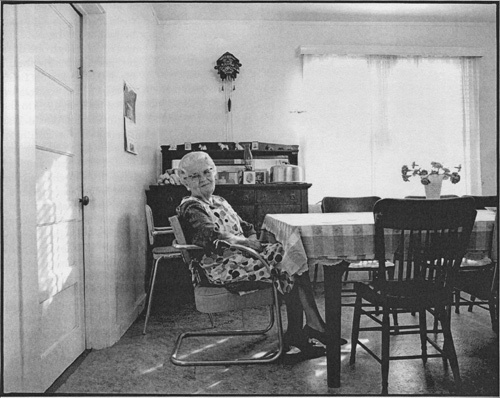 Alice Codoni Hall (1898-1991) lived on D Ranch at Point Reyes. Her father Quinto Codoni was part of the wave of Italian-speaking Swiss who immigrated to West Marin from the Canton of Ticino in the mid-19th century. “In 1873, he started working on the Charles Webb Howard ranches, taking hogs to market,” Whitney writes in her commentary. “He eventually became the chef hog and cattle buyer in the area. He had a hog and cattle butchering business in Point Reyes Station.” Quinto even came to be a part owner of the schooner Point Reyes that transported the meat to San Francisco. “Quinto Codoni was considered ‘Mr. Point Reyes,'” Whitney adds, and when the [narrow-gauge] railroad was standard-gauged from Fairfax to Point Reyes Station [in 1920], he drove the ceremonial gold spike. “His house in Point Reyes Station was very elegant and had a Delco plant to generate electricity for his house and a few neighbors. “Alice went to school at the old school house on the hill [across Highway 1 from present-day West Marin School], and then when it was built, the Black School,” which was located where the firehouse is today. She married William T. “Bill” Hall in 1919, and in 1925, they leased N Ranch. In 1927, Bill acquired D Ranch, and the family moved there from N Ranch in 1936. The Halls had about 100 dairy cows, which would be a very small herd by today’s standards. Whitney adds, “Carol Horick grew up on her family ranch — the D Ranch overlooking Drake’s Beach — already in the thick of it as an eight yer old with her first 4-H project. 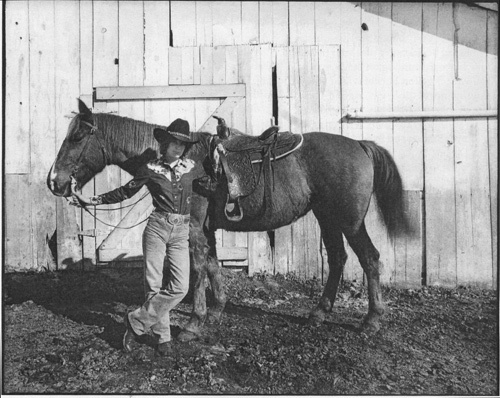 First it was lambs, then cows, and always horses.” She was “the quintessential cowgirl. ‘I remember being on horses all the time,'” she said in an interview. Retired restaurateur Pat Healy chats with other guests while standing in front of two photos of herself at the old Station House Café. The café had been owned by the late historian Jack Mason and then Claudia Woodward. Pat and her short-term partner Jackie Hordoko bought it on Feb. 19, 1974. On Dec. 3, 1989, the café opened in its present location, the refurbished Two Ball Inn building. On June 1, 2005, Pat sold the business to Sheryl Cahill but retained ownership of the building and grounds. 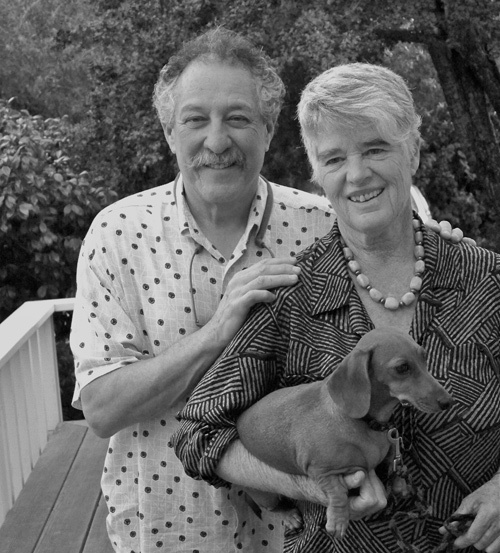 Before moving to Point Reyes Station, Pat had been a well-regarded jazz singer in the vein of June Christy, Anita O’Day and Billie Holiday. Although she had performed mostly in the West — Los Angeles, Las Vegas etc. — she had also performed in Canada and toured the US with Ray Anthony’s big band. 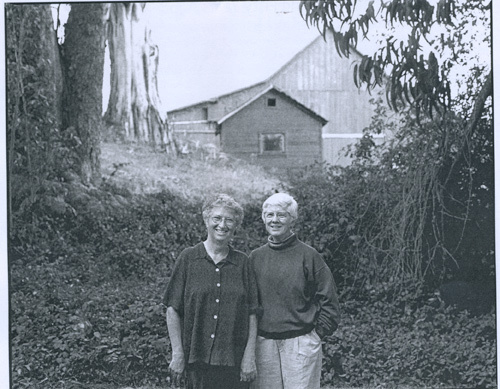 MALT CO-FOUNDERS — The late Ellen Straus, an organic dairy rancher in Marshall (left), and environmentalist Phyllis Faber co-founded Marin Agricultural Land Trust in 1980. “Ellen Tirza Lotte Prins was born Feb. 21, 1927 in Amsterdam, Holland,” notes the website of the family creamery. “In February 1940, Ellen and her family fled to New York, just ahead of the Nazi invasion. “Ellen quickly learned English and graduated in 1948 from Bard College in New York with a hope to practice medicine. A year later, Ellen was introduced to Bill Straus, a German, Jewish immigrant. 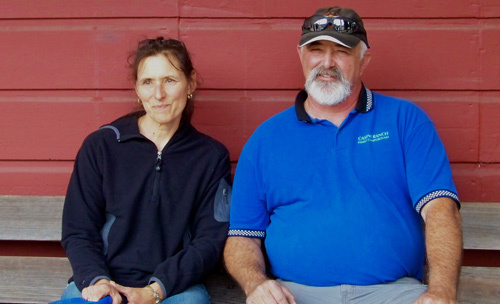 After courting for 16 days, they married three months later and came to ‘honeymoon permanently’ on the shores of Tomales Bay, where together they grew the dairy and raised four children…. 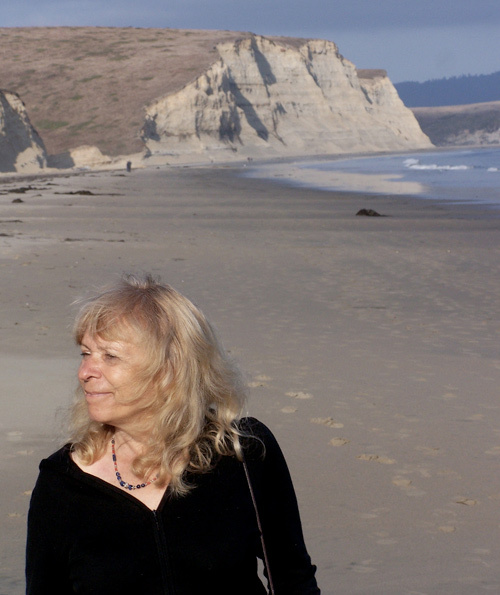 Phyllis, an author and educator, has been a California Coastal Commissioner and a vice president of the California Native Plant Society. She graduated from Mount Holyoke College in Massachusetts with a major in Zoology and received a master’s degree in Microbiology from Yale. Some of her most important work, she’s said, has been editing and publishing environmental books and articles. 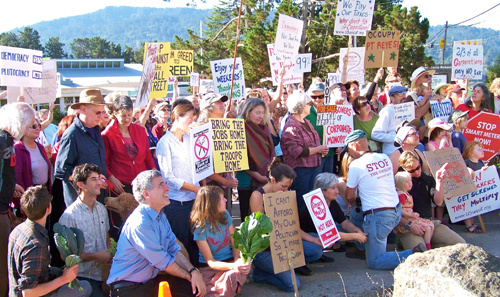 MALT grew out of Ellen and Phyllis’ concern that agricultural land in West Marin was being subdivided and no longer used as working open space. To counter this trend, MALT — with money from donors and grants — began buying agricultural easements from ranchers. The easements allow ranchers to continue ranching their own land but in perpetuity prevent residential or commercial development of the property. To compensate ranchers for accepting the easements’ restrictions, MALT typically pays them half the appraised value of their land. The money is often used to make improvements to the ranch or pay inheritance taxes in order to keep the ranch in the family. So far, 44,100 acres of ranch land in West Marin is being protected from development by MALT easements. Women of West Marin will continue through Dec. 31 in the Jack Mason Museum of West Marin History. The museum shares The Gables, Mason’s former house, with the Inverness library, and visitors can see the show whenever the library is open. Library hours are: 3 to 6 p.m. and 7 to 9 p.m. Mondays; 10 a.m to 1 p.m. and 2 to 6 p.m. Tuesdays; 10 a.m to 1 p.m. and 2 to 6 p.m. Wednesdays; closed Thursdays; 3 to 6 p.m. Fridays; 10 a.m. to 1 p.m. Saturdays; closed Sundays. For a town with only 85 residents, Duncans Mills, which is on the Russian River just upstream from Jenner, contains a surprising amount of history from the Marin and Sonoma county coasts. West Marin oldtimers may recognize this narrow-gauge passenger car from the North Pacific Coast Railroad, which operated from 1875 to 1930 between Sausalito and Cazadero. 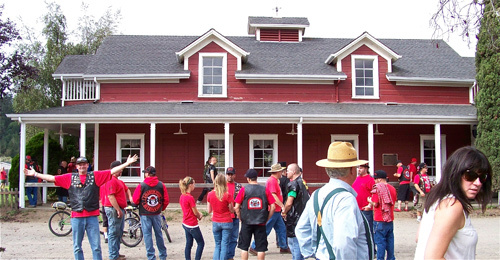 Point Reyes Station’s present post office was the town depot, and the Red Barn (now painted green) was the engine house. For the rail line’s first year and a half, the northern terminus was in Tomales, but after a 1,700-foot-long tunnel was dug through “Tunnel Hill,” the line was extended to Valley Ford and Occidental (then called Howard’s) and on to the Russian River area. 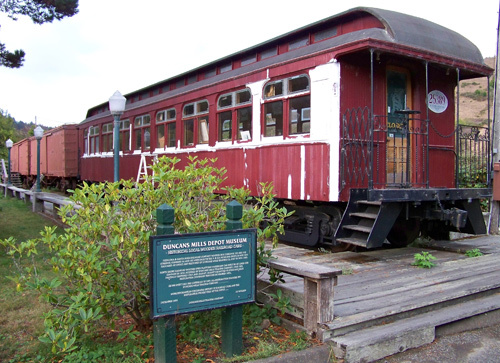 After the line shut down in 1930, this passenger car, which is now being repainted, was the Point Reyes Station library until 1957. The late Mike Contos bought the car in 1957 and kept it at his trout farm, which was located where Point Reyes Station’s Caltrans corporation yard is today. The late Toby Giacomini, who at one time owned Toby’s Feed Barn and Toby’s Trucking, bought the rail car in 1975 and moved it downtown to where West Marin Storage is now located. Millerick Brothers of Sebastopol purchased the car in 1981 and kept it at Millerick Brothers Boat Yard until 1983 when Duncans Mills Trading Company bought it. The old rail car was then moved it to the Duncans Mills Depot Museum, where it is currently being restored for the fourth time. After a ceremony that took note of the history of this 140-year-old barn in Duncans Mills, Clamper Kevin Dixon of Vallejo (at left) from Sam Brannan Chapter 1004 indicated with a gesture what a great day it was. 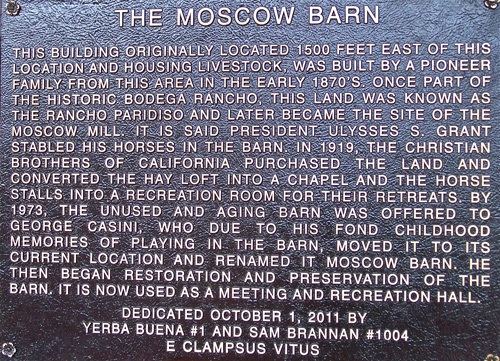 On Saturday, two chapters of E Clampus Vitus dedicated a plaque in Duncans Mills, memorializing another piece of coastal history, Moscow Barn at Casini Ranch Campground. The structure is so old that President and former Civil War General Ulysses S. Grant is believed to have stabled horses there at one time. The “plaquing” was carried out by Sam Brannan Chapter 1004 (Napa, Glenn, Colusa counties “and protector of Solano”) and Yerba Buena 1 (“the Mother Lodge”), which is based in San Francisco. 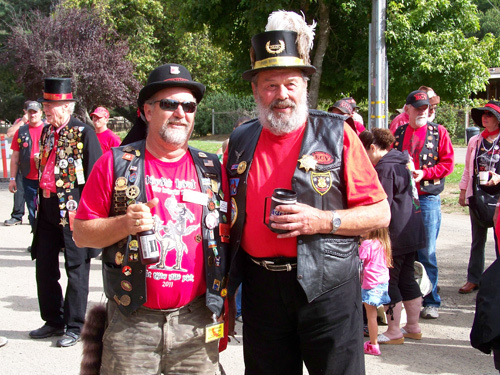 It was the second time a group of Clampers had dedicated a plaque in Duncans Mills. Back in 1989, Yerba Buena 1 placed a plaque on the Blue Heron Restaurant and Tavern, recalling an odd bit of town history. In 1877, Black Bart for a second time robbed the stagecoach between Fort Ross and Duncans Mills. The outlaw would eventually rob a total of 28 stagecoaches while never firing a shot. What made the second robbery worthy of Clamper recognition is that for this heist, Black Bart wrote a short poem and left it with the stage. Clampers, by the way, have also left their tracks in West Marin. 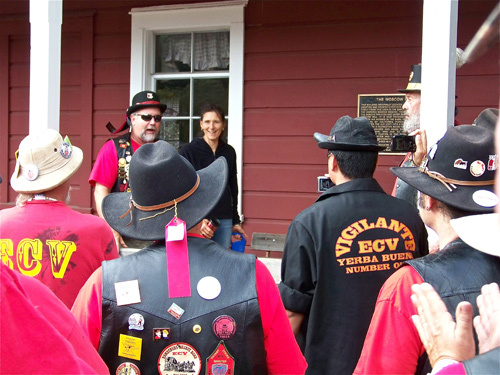 In 1998, the two groups dedicated a plaque to Tomales’ historic downtown, mounting it on a traffic island in front of the William Tell House. In 2008, they placed a plaque in Tomales Town Park, marking the site of the house of Warren Dutton, a co-founder of the town. The house was destroyed in the 1920 town fire. Yet another plaque was mounted at the Point Reyes Lifeboat Station. The leader of each chapter or lodge of the Clampers is known as the Noble Grand Humbug. Here Jim “Woody” Morton (at left), the Humbug of Sam Brannan 1004 jokes with Nils “Hagar” Anderson, Humbug of Yerba Buena 1. 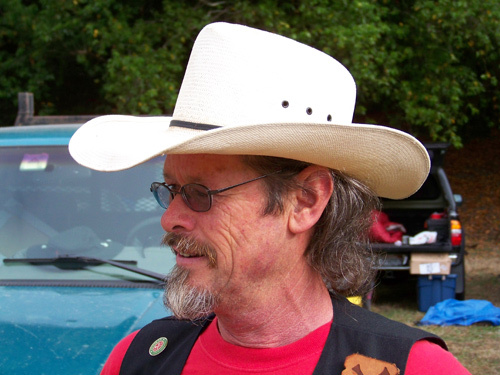 Loren Wilson, who once lived on the Cereni Ranch just north of Tomales near Fallon, is an ex “Sublime Noble Grand Humbug” of all the Clampers, as well as a past Noble Grand Humbug of Sam Brannan Chapter 1004 and a current Clamper historian. In 1919, the Christian Brothers had bought the neighboring land where the barn was located to start a retreat for boys. The barn’s stalls were converted into a recreation hall that was also used as sleeping quarters, Paul said, and the hayloft was converted into a chapel. By 1973, he added, the barn was no longer being used and was in disrepair, so the Christian Brothers decided to have it torn down and offered the Casinis the lumber. However, his father had been baptized in the chapel and played in the barn as a boy, and he was fond of the building, Paul said. His family then moved the barn 1,500 feet to their property. On the way, the barn had to travel down a slope, and Gina said she’d been amazed it didn’t shake apart. Fortunately, the barn arrived safely and her father then restored it. Humbug Morton and Gina Casini during the plaquing. Gina told the crowd of almost 200 about going to movies in the barn as a youth. More recently she’s taught line dancing there and would like to do it again, she added. Nowadays, however, the former livestock barn is primarily used for weddings and other group events. The two humbugs then “anointed” the plaque with bottles of beer. Sparsely Sage and Timely is powered by	WordPress 4.9.10 and delivered to you in 0.915 seconds using 51 queries.